Rear (L/R): James Oswald, James, Eliza Jane, John William, Ernest Albert. Harry Walter, Pearl Amelia and Frank Rowland. As described in Part I, James and Johanna had twelve children, one of whom, George Bruce Free, died at Lalbert as an infant. 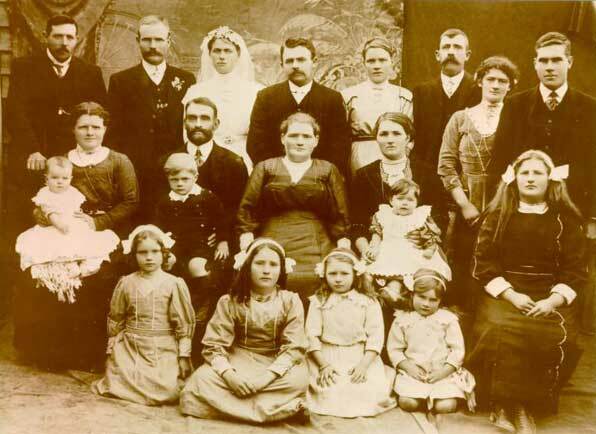 The others, shown in the photo above, all grew into adults, married and had families of their own. Their oldest son, James Oswald Free (1892-1967), was born at Thalia in Victoria. He married Emma Elizabeth Oliver (1894-1955), the daughter of Robert Hamilton Oliver (1868-1939) and Mary Ann Edmeades (1863-1942), at Lalbert in 1913 (their wedding photo is shown on the right). Emma's parents and family can be seen in the photo that ends this section below. After their marriage, James and Emma lived on James' farm at Talgitcha where they spent the rest of their lives. The Australian War Memorial database shows that one of their sons, John Henry Free, enlisted in the Second AIF in Queensland on 22 April 1943. He was then single and living at Lalbert with his parents. John was discharged on 13 December 1945 by which time he was a Corporal in the 15 Australian Transport Platoon. Click here to see a possible photo of James Oswald and one of his daughters - either Annie or Dorothy Free before they were married. ...the sudden passing of Mr James Oswald Free came as a severe shock to his many relatives and friends. Aged 75 years, Mr Free came to the Quambatook district 69 years ago, being a member of a family who have been closely associated with the development and progress of the district, especially in the areas where they were engaged in agricultural pursuit. Born at Corack, he was only 6 years of age when he came to Lalbert East, and he spent the remainder of his life there. He was educated at the local school, spent his young days in the district, where he was a well-known footballer. Like many others who derived their livelihood from the land, Mr Free had to experience bad years and indifferent times ... However imbued with the fine spirit of the early settlers, and with unshakeable faith in the capacity of the district to produce, he worked hard until good years and stabilised prices for primary products brought reward. Mr Free, by his own forsight and industry, like others, did much to improve the land on which he lived and kept abreast of the latest production methods.... Mr Free enjoyed the blessing of a large family, the majority of whom have settled in the district and become fine citizens. 1. Robert James ('Bob') Free (1913-82) married Eileen Margaret Cummins (1921-80) at Kerang in 1943. 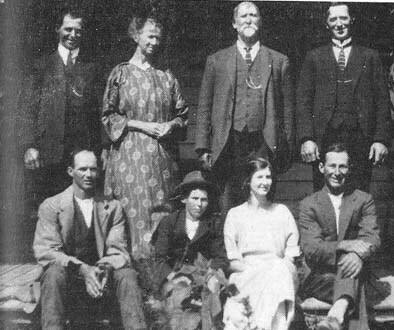 Eileen's parents were Michael Henry ('Mick') Cummins (1878-1948) and Annie Mary Shields (1892-1928) who were married in Victoria in 1915 and farmed land in the parish of Cannie. After their marriage, Bob and Eileen farmed at Lake Charm near Kerang but seemed to have lived at Kerang where Eileen died in 1980 and Bob in 1982. Although still to be confirmed, we believe they had a daughter, Valerie Margaret Free who married Peter Leslie Hubbard and had two boys. 2. John Henry ('Jack') Free (1916-96) married Rachel Elizabeth Morris (1913-87), the daughter of John Henry Bate Morris (1880-1971) and Rebecca Keturah Davies (1880-1973), at Apollo Bay in Victoria in 1947. 3. 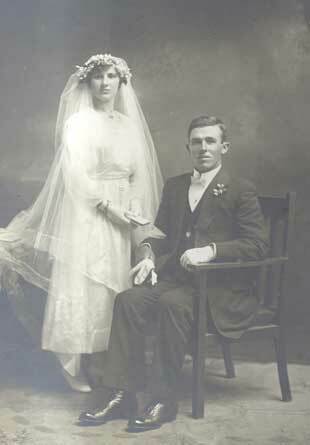 Annie Florence Free (1918-92) married Bendigo-born Vernon Joseph Kelly (1913-2009) at Quambatook in 1947. We believe Vernon's parents were William Andrew Kelly (1862-1945) and Mary Teresa Darcy who farmed land at Budgerum between Quambatook and Kerang. Annie's gravestone in the Quambatook Cemetery tells us she and Vernon had four children: Cheryl Elizabeth, Graham William, Gerard James and Brian Joseph Kelly. 4. George Arthur Free (1924-2009) married Nancy Beryl ('Nance') Smith (1919-86) at Quambatook (we believe Nancy had three children - Joan, Janette and Douglas - from a previous marriage although that has still to be confirmed). George died at Kerang in 2009, his death notice, published in the Herald Sun tells us he was the 'loved son of the late James and Emma Free. Loved husband of the late Nance. Loved brother of Bob, Jack, Ann (all dec), Dot and Ron and their families. Loved brother-in-law of Pat and Vern (31 January 2009). 5. Dorothy May Free married the farmer Albert John Schlitz (1912-95) at Quambatook in 1948. 6. Ronald Oswald Free married Kathleen Margaret Lynch at Kerang in 1953. The Oliver family on the occasion of the marriage of Jack and Ruby Oliver (nee Bennett). 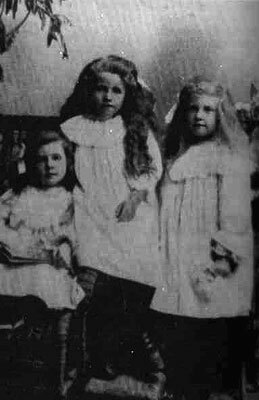 Bertha Oliver (later to marry Jack Hughes), Amy Cass and Jean Cass. James and Johanna's eldest daughter, Johanna Victoria ('Ciss') Free (1893-1973), was also born at Thalia in Victoria. In 1917 she married John James ('Jack') Bailey (1890-1957) at Lalbert (their wedding photo is shown on the left). John was the son of Hugh Andrew Bailey, whose father hailed from northern Ireland, and Jane Hosking who were married in 1897. They had two boys - Hugh Andrew jnr and John James - before Jane's death in 1890. Hugh married another member of Towaninnie's pioneering families, Annie Eliza Wright, in 1896 and had four further children: Stewart Berkeley in 1898, Albert Edward (1902), Evelyn Ethelrine (1907) and Richard Raymond Bailey (1910). Hugh and Annie and Hugh's six children are shown in the photo below. The Australian electoral rolls show that Jack and Johanna were farming at Lalbert at the time of the 1919 and 1924 elections and at Nowie near Swan Hill in the 1930s. The 1942, 1949 and 1954 rolls have them at Woorinen and Jack working as a labourer. After Jack's death at Swan Hill in 1957 Johanna continued to live at Woorinen with her son Allan James Bailey and his family until her own death there in 1972. Jack and Johanna had two sons: John James Bailey (1917-18) and Allan James Bailey (1926-2012) who worked as an orchardist and married Monica Anne Austerberry (1926-2016), daughter of Edgar Joseph Austerbury and Annie Veronica Kiley, at Swan Hill in 1948. Monica died at Swan Hill in 2016. Her tribute posted on the Swan Hill Funerals website tells us she was 'formerly of Woorinen, the 'loved wife of Alan (dec), loving mother and mother-in-law of Karen and Rod, Maree and Andy [Belyea] and Jo and Mark. Proud grandmother of Doug and Samantha, Narelle and Glenn, Davina and Brent, Blake (dec), Teneille and Dion and Bianca and Jess. Great grandmother of Jasper, Mitchell, Harry, Sophie, Hailey, Eden (dec) Joel, Willa, Max, Ava, Declan, Eliza and Voss'. 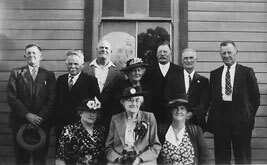 Eliza Jane ('Dolly') Free (1894-1972) attended Talgitcha and Lalbert State Schools with her siblings and cousins (see the photo below). In 1918 she married Robert ('Bob') Williamson (1886-1965) at Lalbert. 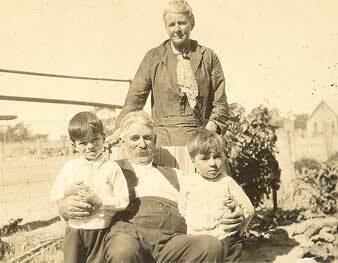 Bob was the eldest son of William Williamsom and Helen Dalgleish, farmers of Boort who were married there in 1882. His siblings included: Violet (born at Boort in 1884), Lewis (1889), Peter (1891) and Helen Tracey Williamson (1893). 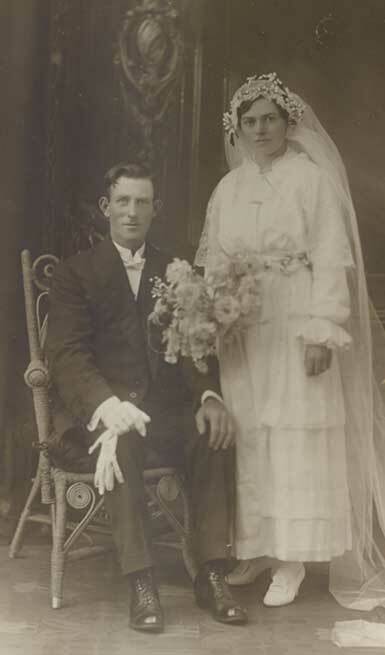 Lewis Williamson married Lily Sybil Robbins at the Melbourne suburb of St Kilda on 29 March 1916 and, like Robert, lived and farmed near Quambatook after his marriage. 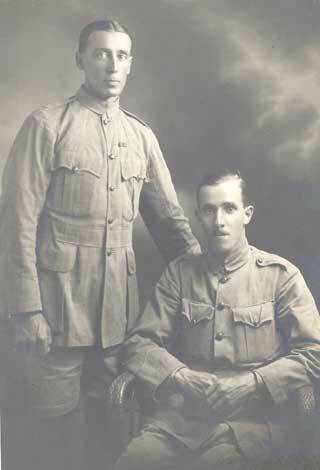 Their younger brother, Peter Williamson, had enlisted in the First AIF in February 1916, embarked from Melbourne on the A67 ORSOVA on 1 August 1916, and was killed in action near Villers Bretonneux in France on 18 July 1918 while serving with the 2nd Machine Gun Battalion. FREE-WILLIAMSON. A quiet but pretty wedding took place at the residence of the bride's parents on Saturday November 2nd, when Miss Eliza J. Free, of Lalbert East, was married to Mr Robert Williamson, of Cannie, eldest son of Mr W. Williamson of Boort. The ceremony was conducted by the Rev. K. Kirkpatrick, of Boort. The bride who was given away by her father, wore an exquisite gown of ivory crepe-de-chene, trimmed with shadow lace, stitchings and embroidery. The veil was of embroidered tuile, and she wore a coronet of orange blossoms. She carried a bouquet of pale pink and white roses, daintily arranged with maiden hair fern and streamers, the gift of the bridegroom. The bridesmaid, Miss Pearl Free, sister of the bride, was attired in a fuji silk coat frock. and carried bouquets of roses and maiden hair fern, the gift of the bridegroom. The duties of best man were carried out by Mr J. W. Free, brother of the bride. The wedding reception was held in a large diniing room where about 20 guests partook of a sumptuous breakfast. The bridegroom's gift to the bride was a gold wristlet watch; bride to bridegroom, gold sleeve links; bridegroom to bridesmaid, cameo bangle. They were the recipients of many costly presents. The bride travelled in a navy blue costume, with a hat to match. The bridal party motored to Quambatook, and caught the morning train, en route for Melbourne where the honeymoon was spent. The Australian electoral rolls show that after their marriage Bob and Dolly farmed at Cannie until some time between 1954 and 1963 when Bob retired and they moved into Quambatook to live. As the late Win Noblet describes in her book Beside the Bullock Track: Quambatook 1894-1984, their move into town did not result in any slow-down of their respective community and philanthropic activities. 'Mr Williamson [especially] took a keen interest in everything that existed for the good of the district, supporting practically every organisation' She continued that Bob 'came to Cannie as a young man, where he engaged in farming pursuits, and always found time for sport, being especially adept at cricket and football, both of which he played with relish and success. In later years, despite a disability which necessitated the use of a walking stick, Mr Williamson took up bowls and derived the same intense pleasure from yet another sport. In all of his long public life, perhaps his greatest work was on behalf of the Victorian Country Party, for which he served an unequalled record spanning over forty years, accepting the office of President of the Branch, but his greatest work in the interest of the Party was performed during 31 years in office as Secretary. Mr Williamson was a Justice of the Peace for the Midland Bailiwick for some years. His work in helping to raise funds to build the Quambatook Hall was of inestimable value to the Committee, while his outstanding generosity as a donor to the appeal for funds, helped considerably in Quambatook being able to build such a splendid hall. He was justifiably proud of the building and on opening night, was one of the first to take the floor for the first dance - a circular waltz. Some had tears in their eyes as they witnessed he and his partner dance so graciously . . . Mr Williamson's other associations with the district included the Public Park, of which he was a trustee, and the Agricultural Society Show, for which he was an untiring worker. He was a great supporter of the Quambatook Football Club, and rarely missed a match. He loved dearly his church, and was an ordained Elder of the Prebyterian Church' (p. 280). Bob Williamson died at nearby Kerang in 1965. His funeral service at Quambatook 'saw a crowded church, including a large number of mourners representing many parts of the Country Party Branches in Victoria, who had travelled long distances to pay a final tribute to an esteemed friend and colleague'. Dolly Williamson nee Free died in 1972. We believe she and Bob had no children. Charlie Bennett, William Hickmott and Frank Adler. Front: Dolly Williamson (nee Free), Frances Elliott and Mrs Oliver. George Baker, Allan Kendall, Vic Hahnel, Eric McKissak, Laurie Free, Bill Parker, Laurie Nalder, Bob Williamson and Don Baker. Successful. Miss B. Rangott won two races with Louvenir and Dolly, both being well ridden by Gooding. At Koondrook Miss Rangott won the pony race with Vida. Louvenir is by Expectation, as is also Heather, which ran second in the pony race. 1. 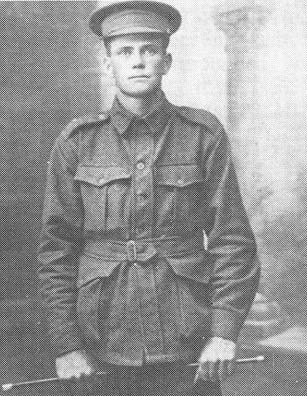 Colin John Free (1919-97) who enlisted in the Second AIF at Swan Hill on 17 March 1941. He was then living at Woorinen in Victoria and his next of kin was G. Free. He was discharged on 1 April 1942. By then he was a Private in 4 Provost Company. Colin married Gladys Joy Cooper (1925-2003), the daughter of Arthur Cooper and Olive Alice James at Swan Hill in 1942. The Australian electoral rolls show Colin, a vineyard worker, and Gladys were living at Woorinen in Victoria at the time of the 1949, 1954 and 1963 elections. Not long after this they moved to Swan Hill where they lived at 86 Stradbroke Avenue until at least 1980. Colin John Free died at Swan Hill in 1997. Gladys died in 2003. Her death notice, published in the Herald Sun on 21 January of that year, tells us she was the 'loved Mum and mother-in-law of Lynette and John, Neville and Marg, Norma (dec), Glenys and David, Rodney and Karen and all her grandchildren and great grandchildren. Her pleasures were simple, her needs were few, if her family was happy then she was too. She gave us love in the fullest measure, care, devotion and memories to treasure. She shared our hopes, our dreams, our tears. Thank you Mum for all those wonderful years'. 3. Alfreda Norma Free who was born at Kerang in 1923 and married Alfred Charles Kiley (1917-89), the son of James Edward Kiley and Ellen Barrett, at Swan Hill in 1945. 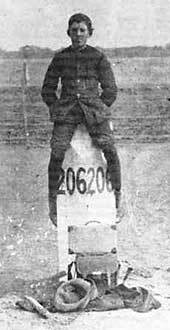 The Australian Archives shows that VX147513 Alfred Charles Kiley enlisted in the 2nd AIF (no date provided). His NOK at the time was James Kiley. It also shows that a James Francis Kiley, born on 10 November 1907 at Birrewellock in Victoria, also enlisted in the 2nd AIF. The Australian electoral rolls show that Alfred Charles, who was working as a barman, and Alfreda Norma were living at 35 Jordan Street in South Melbourne at the time of the 1949 and 1954 elections and c/- Carrick, Yarrawonga Road in Cobram in 1963. It seems that they then separated. The 1968 roll has Alfreda working as a clerk and living at 14 Donald Street in Prahan (Alfred Charles was still registered as living at Cobram). In 1977 she was working as a shop assistant and living at 72 Kingsclerc Avenue in Noble Park and was still at Noble Park - at 2/1193 Heatherton Road - in 1980. The 'Maher/Green/McLean/Bradley' family tree on Ancestry.com tells us that Alfred died and was buried at Cobram on 29 August 1989. Their site includes a photo of his headstone which reads: 'ALFRED CHARLES KILEY (LAL) (11/9/1917 - 29/8/1989) Husband of Norma, loved father of Gaye and Suzanne, F.I.L of Brian, grandfather of Paul, Shaun, Ryan, Kylie, Melissa. It adds the Alfred's wife. 'Norma Adelaide Free' died in 1986. 4. Albert James ('Alby') Free (1925-2004) who was born at Quambatook and married Beatrice Lorraine ('Betty') Logan (1934-2018), daughter of Robert Logan and Hilda Wisner, at Swan Hill in 1952. The Australian electoral rolls show Alby, who was then working as a labourer, and Betty were living at Woorinen in Victoria at the time of the 1954 and 1963 elections and at Murraydale in Victoria at the time of the 1968, 1972 and 1977 elections (Alby was then working as a water bailiff). Sometime after this they moved to Swan Hill where Alby died in 2004 and Betty in 2018. Betty's death notice tells us she was the 'loved mother ofJeff and Jan, mother-in-law to Rae and friend to Jeff. Adored Nan to Robert and Renee, Rebecca and Ken, Royce and Christine, Belinda and Cameron, Alex and Shay and Great Nan to all her great grandchildren and precious little Kouta'. 5. Laurel Kitty Free who was born at Swan Hill in 1928 and married Cecil James Jackson, son of James Albert Jackson and Alice Jessie Marchment, at South Melbourne in 1949. The Australian electoral rolls show that Cecil, an electroplater, and Laurel were living at 97 Raglan Street in South Melbourne in 1949, and at 254 Clayton Road Dandenong from 1954 to 1980. The Ryerson index shows that a Cecil James Jackson was cremated at the Springvale Botanical Cemetery on 11 February 1980. We believe he and Kitty had two daughters. 6. Reville Alexander ('Rev') Free (1939-2012) who was born at Swan Hill in 1939 and married Anne Lynette Ferris, daughter of Hubert Norman Ferris and Hilda Hough, there in 1960. The Australian electoral rolls show that Reville, a policeman, and Anne, a clerk, were living on Hannah Street in Frankston in 1963; at 1 Buchan Street Swan Hill in 1968; and at 20 Albany Crescent Surrey Hills in Melbourne in 1977 and 1980 (a Carey Paul Free, machinist, was also registered there in 1980). According to 'The Mob c3 (2012)' family tree on Ancestry, Reville died in Melbourne on 24 October 2012. His death notice in the Herald Sun tells us he was the 'much loved father of Carey and Ashley, treasured father-in-law of Lesley and Danni. Adored Poppy and 'Poppo' of Bianca, Sheridan, Michael and Bailey. Anne died in 2017 by which time she and Reville had a further grandson, Ash, and a great grandson, Harrison. Born at Quambatook in 1897, Ernest Albert Free (1897-1976), a farmer at Lalbert, was married twice, at Quambatook in 1918 and Swan Hill in 1927. His first wife was Mary Ellen Keating (1900-27), the daughter of Daniel James Keating (1871-1952) and Bridget Teresa Mangan (1873-1944), who was born at Bendigo and died at Quambatook in 1927. Her father's death notice, published in the Melbouren Argus on 4 July 1952, tells us her siblings were Martin, Margaret, Agnes, Bridget and Alice Keating (where all but Margaret were deceased). Ernest's second wife was an English woman Clara Wilson (1903-82). According to 'James Cousins' family tree on Ancestry, Clara was born at Rotherham in Yorkshire on 12 August 1903. Her parents were Robert Bonner Wilson (1860-1937) and Catherine Healey (1860-1929). Her granddaughter, Belinda Bam, tells us Clara came to Australia with her family when she was eight or nine years old. Ancestry's 'UK Outward Passenger Lists, 1890-1960', shows that a Clara Wilson, aged eight years, sailed with her parents and five siblings, to Australia on the Demosthenes of the Aberdeen Line. The ship departed from London on 26 June 1912. The passenger list shows that Clara's parents were Robert (a 50 year-old farmer) and Catherine Wilson (49). Her siblings were Eleanor (26), Annie (23), Gertrude (20), Florence (16) and John Wilson (11). Although the ship was destined for Brisbane, the family disembarked at Melbourne. 1. Born at Kerang, Lawrence Martin ('Laurie') Free (1919-74) married Rita Agnes Ellis (1919-2018) at Quambatook in 1941. Rita's parents were Francis Ellis and Margaret Johnston who we think farmed land at Towaninnie. The Australian electoral rolls show that Laurie and Rita lived at Lalbert until Laurie's death in 1974. He was killed, tragically, in a accident on the Swan Hill to Quambatook road. In her book, Beside the Bullock Track: Quambatook 1894-1984, the late Win Noblet tells us he was an avid 'member of the congregation, Board of Management and, latterly, an Elder of St Andrew's Church at Quambatook . . . in the field of sport he was an ernest player and administrator of both football and lawn bowls (where he was twice Club President and twice club champion)'. At Laurie's funeral, the Rev Kilpatrick gave special 'tribute to a wonderful man, who had left an indelible impact on the community and her family. After Laurie's death, Rita continued to live at Lalbert, probably with her son, Ian Lawrence Free, who was farming there, before moving to Quambatook and then Swan Hill where she died in 2018. Her death notice informs us she was the 'dearly loved and loving wife of Laurie (dec), much loved and respected mother and mother-in-law of Marg and Norm (dec) Jewson, Gwen and Angus Gawne, Cheryl and Murray Arnel [and] Ian and Colleen Free. Loved grandma of 9, great grandma of 18 and great great grandma of 2'. Dot Bennett, Mrs A. Richmond, Eileen Keating, Daisy Baker, Rona Kendell, Dolly Williamson, Rita Free and June Knight. 2. Ernest Raymond ('Ray') Free (1920-2001) enlisted in the Second AIF at Geelong on 7 June 1942. He was then living at Cannie in Victoria and his next of kin was his wife Purvis Jean ('Mardi') Manuel (1922-68) who he had married at Kerang in 1942. 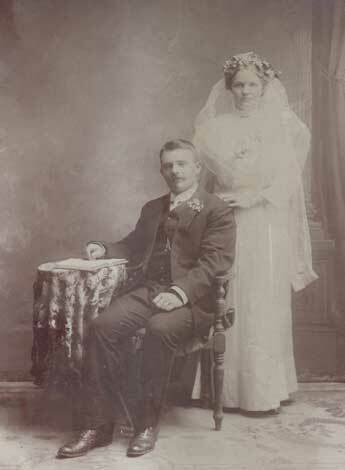 Mardi's parents were Roby Lewis Manuel (1895-1975) and Annie Amelia Downs Freeman who were married in Victoria in 1916. Kerang-born, Roby Manuel spent his early days at Bael Bael before moving with his family to Normanville in 1901. He and his brother, Clarence Arnold Manuel, enlisted in the First AIF at Warracknabeal in Victoria in April 1916 and embarked from Adelaide as part of the reinforcements for the 43rd Battalion. As Win Noblet has written: 'Roby saw service in France, but never concealed his ardent desire to join the Air Corps. Eventually he received a transfer, but as a driver, where his particular job was to drive the squadron's commanding officer from place to place'. He eventually convinced his OC that he should become a pilot and 'was sent to the Royal Air Force Station at Waddington near Lincoln for flying training'. After gaining his wings in August 1917, Roby returned to France where he was credited with twelve official aerial victories and promoted to the rank of Captain. At War's end, Roby was seconded to the RAF before returning to Australia in May 1919. In April of that year he led a fly past over London in honour of Anzac day. Unfortunately his brother, Clarence, was not there to see it, having been killed in action in May 1918 near Villers Bretteneux while serving as a platoon sergeant with the 43rd Battalion. Back in Australia, Roby kept on flying, becoming in the process the only person in the country to have held a pilot's licence for 50 years. He served in the RAAF during the Second World War and had the pleasure of seeing first his two sons, Max and Kevin Manuel, and his son-in-law, Ray Free, securing their pilots' licences and then two of his grandchildren doing the same. As Win Noblet relates, during his long life Roby served two terms as as a Kerang Shire Councillor. 'On the farm', she continues, 'he evolved a method of handling wheat in bulk from headers and silos, and could be aptly described as the pioneer of means by which grain was so easily handled in bulk at this time'. She concluded approvingly that although 'Mr Manuel has written great pages into the annals of history . . . he remained at heart a modest Mallee farmer' (p.290).
. . . There was probably not a better known or widely respected personality in the district than Mrs Free. The eldest daughter of Mr and Mrs Roby Manuel, she possessed great charm of manner and was a most likeable and friendly person in every way. Born in the district, she took part in many activities, displaying a talent that made her an outstanding figure. She was a member of the Sand Hill Lake tennis team, and competed regularly in Quambatook. On her marriage to Ray Free she became part of the Cannie district, and her death was a loss to Cannie. She loved gardening and her garden was one of the show places of the district, taking innumerable prizes at the district agricultural shows for years, and was principal exhibitor at the local flower shows as well. Her ability was not only confined to flowers, as she was excellent at cooking, decorative art and floral work. Mrs Free won a high place in the hearts of everyone for her happy disposition, friendly manner towards all, and there were so many friends over the wide district, who mourned the loss of a fine and sincere friend, the soul of hospitality, everyone was welcome to her home. She was interested in many activities and cheerfully lent a helping hand to many efforts, both at Cannie and Quambatook. Devoted to her home and family, her life was a model of loving wife and mother. Throughout her life, Mardi was a wonderful citizen and neighbour and her untimely passing was a heavy blow to members of her family, her husband Ray, and four daughters, Lynette (Mrs Joe James), Jan, Glenda and Zenda, her parents, brothers and sisters (pp. 291-2). Ray continued to farm at Cannie until the mid-1970s when he moved to Cohuna. He also remarried - the 1980 electoral roll shows him living on McMillan's Road in Cohuna with a Madge Vivienne Free. Ray died and was buried at Quambatook on 20 August 2001. He and Mardi had four children: Lynette, Janet, Glenda and Zenda Free. 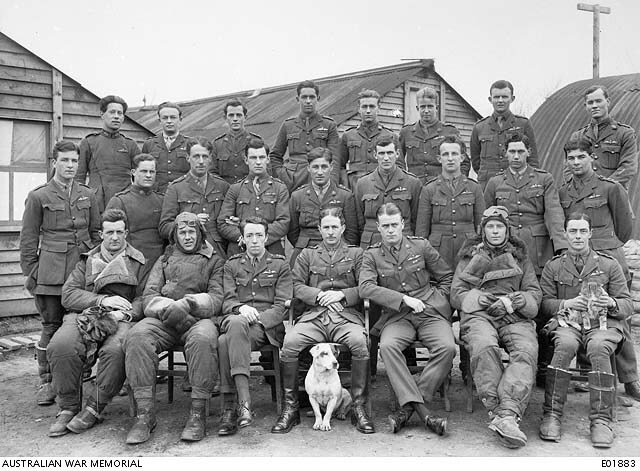 (last on the right in the centre row) with his fellow officers of No 2 Squadron, Australian Flying Corps. 3. Kevin James Free (1924-2013) enlisted in the Second AIF at Caulfield on 6 February 1942 and served as a private soldier in the 2/24 Infantry Battalion until he was discharged from the Army on 29 August 1946. He married Adelaide-born Norma Florence Mary Manuel (1922-2007) at Kerang in 1943. Norma's parents were Ernest Owen Manuel (1891-1954) and Mary Ann Quigley who were married in the Gilbert district of South Australia in 1913 and had five children in addition to Norma: Phyllis Marjorie, Dora Eileen, Owen Charles, Gordon Ernest and Melville Keith Manuel. Her grandfather, William Owen Manuel (1866-1916), was the eldest son of a Cornishman, William Manuel (1838-1907), and Adelaide-born Lavinia Freeman (1846-1901) who were married at Kapunda in South Australia in 1863 and had eleven children one of whom, Clarence Edwin Manuel, was the grandfather of Purvis Jean ('Mardi') Manuel who married Kevin's brother, Ernest Raymond ('Ray') Free. His military record in the Australian Archives shows that Norma's grandfather, William Owen Manuel, enlisted in the First AIF at Adelaide on 18 December 1915. He was then a 45 year-old labourer and gave as his NOK his wife, Elizabeth Florence Manuel, of Prospect in South Australia (he also stated he had no children). William proceeded overseas in September 1917 as part of the reinforcements for the 43rd Battalion in France. After a bout of sickness en route followed by a period of training at Etaples he eventually joined the 10th battalion on 10 October 1916. He again became sick and was sent back to England suffering from trench feet and then double pneumonia of which he died in the Sidney Hall Hospital at Weymouth on 24 December 1916. William is buried in the Melcombe Regis Cemetery at Weymouth. The Australian electoral rolls show that Kevin worked as a carpenter and auctioneer and he and Norma lived first at Quambatook and later in the Melbourne suburb of Glenroy. Norma died in 2007 and was cremated at the Carinya Cemetery in Mount Gambier. Kevin died in 2013. His tribute, published in the Melbourne Herald Sun on 8 October of that year, tells us he was the 'much loved father of Rhonda, Ros, Di, Geoff and Sandy. Respected father-in-law of Arch, Graham, Graeme and Jan. Pappy to Deneille, Rochelle, Paul, Linda, Carrie, Joel, Melissa and Lauren. Grand Pappy to Tahli (dec), Cody, Shaye, Keeley, Nate, Sienna, Surry, William, Mala, Dylan, Ben, Jamie, Tait and Blake'. 4. The Australian Archives shows that VX500973 Norman Albert Free (1927-2013) served in the Australian Army during the Second World War. He was born at Woodend and grew up in Sunbury where he married Elizabeth May Muir (1921-2001) in 1948. The Australian electoral rolls show Norman and Elizabeth lived in Sunbury throughout the 1960s. During this time Norman worked as an attendant and later a nurse at the Sunbury Mental Hospital. After raising her four children, Elizabeth worked as a manageress at the same institution. The 1972 roll shows Norman and Elizabeth at the Bundoora (formerly Heidelberg) Repatriation Hospital (their daughter Gail Ann Free was also nursing there). Norman and Elizabeth were still there in 1977 and 1980 along with another daughter, Kerrie Rita Free, who was working as a clerk. It seems they later returned to Sunbury where Elizabeth died in 2011 and Norman in 2013. Their respective tributes published in the Melbourne Herald Sun tells us Norman and Elizabeth had four children - Gail, Peter, Kathleen and Kerrie Free - all of whom married and provided their delighted parents with no less than 15 grandchildren (Belinda, Carolyn, Andrew, Allison, Josh, Jessica, Sean, Susan, Frank, Gregory (dec), Tegan-Skye, Mathew, David, Lauren and Paul) and at least eight great grandchildren (Isabella, Ethan, Amelia, Logan, Charlotte, Maximus, Nathaniel and Xavier). 5. Robert Leslie Free (1929-84) was born at Swan Hill and married Florence Eugenia Stevens in Melbourne in 1948. They either separated or Florence died sometime after 1958 and, after living in the Melbourne suburb of Collingwood for a short while, Robert returned to Sunbury where he worked as a 'brick drawer' and lived in the family home until his death in 1984. Kerry Free tells us he and Florence had two boys and a girl. Roger Free lived in Sunbury for more than seventy years. He attended Sunbury Primary School and completed National Service in the Australian Army in 1952. Roger was employed at the Sunbury Mental Hospital on the nursing staff and after 37 years Roger retired holding the position as Assistant Head Nurse. The staff at the hospital had great respect for him as many attended his retirement celebrations. Roger was a very good sportsman. He played cricket for the Sunbury Cricket Club and was the opening bowler at the age of 14 years. 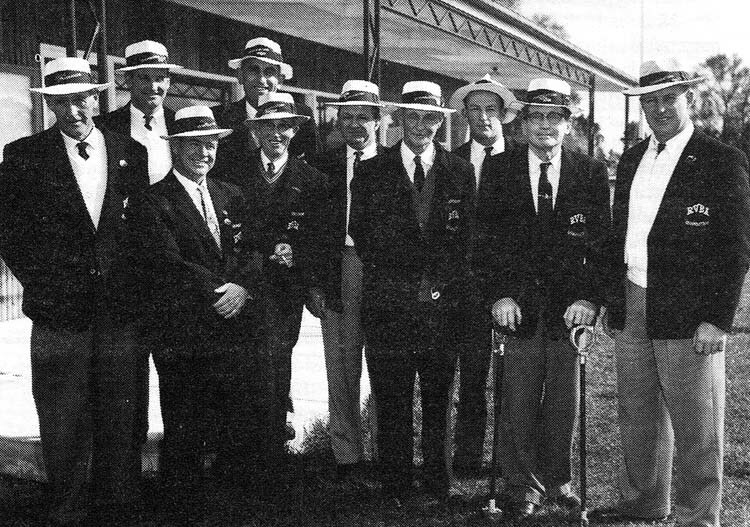 He represented the Gisborne District Cricket Association at Country Week in Bendigo on many occasions. Roger won a number of trophies as a bowler and a couple as a batsman. Roger was a very good footballer and he first played with the Sunbury Football Club in 1948 at the age of 16 years. In 1953 he was the Captain of Sunbury team when they won the Premiership of the Riddel District League after 32 years. 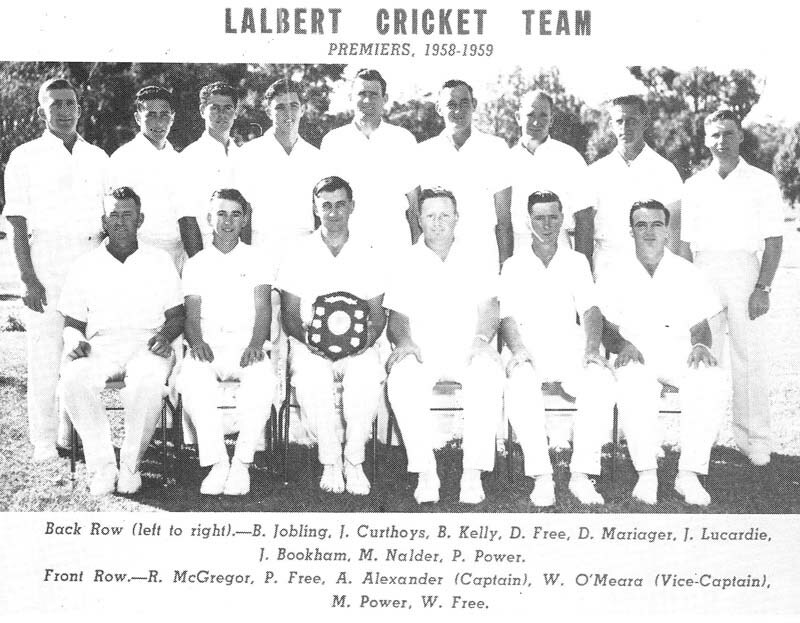 Roger was the Captain/Coach of the Sunbury Football Club's 1955 premiership team and in 1957 he was the Vice Captain of the 1957 premiership team. Roger won the Stanmore Trophy Sunbury Football Club's Best & Fairest award four times. On two occasions Roger was also Captain of the Riddell District Football League that would play other leagues. His sporting achievements for Sunbury over a long period is equal to no other. Roger lived on Pasley Street Sunbury opposite the park on the comer of Miller and Pasley Streets. For more than 15 years Roger looked after the park by watering the young trees by bucket, replacing trees that were damaged, mowing the grass, and collecting the rubbish. As mentioned, Roger died at Sunbury in 2001. His tribute published in the Herald Sun on 22 August of that year tells us he was 'The loving husband of Sheila (dec). Father to Grant, Alistair, Callum, Craig and Rowan. Grandad to eleven grandchildren and five great grandchildren'. Pearl Amelia Free (1899-1972) married James Baden-Powell Hasty (1900-54) at Lalbert in 1923. James was born at Airey's Inlet in Victoria, the youngest son of James Hasty and Annie Murray (pictured below) and grandson of William Hasty (1836-1902) and Margaret Dempsey (1832-1907). One of their descendants, John Hasty, tells us that the old couple hailed from Kilrea in Ireland and had emigrated to Victoria sometime between 1856 and 1858. William and his son James ran a boarding house, named 'Seaview House' at Airey's inlet as well as the Cobb & Co service from there to Anglesea and thence to Geelong. James Hasty married Annie Murray at Anglesea in 1891 and had six children: Agnes Margaret (1891-2), William Robert (1891), Agnes Margaret (1893), Alice Maud (1894), Annie (1896) and James Baden-Powell Hasty (1900). James jnr is pictured in uniform on the left. The photo was taken in 1914 by his teacher P. Allen. James and Annie left Airey's Inlet not long after the birth of their youngest son and spent time at Loddon Vale and Pyramid Hill before settling at Lalbert where James ran the local grocery store (see the picture below). According to his great great grandson, John Hasty, 'old Jim (Hasty) used [also] to work on the roads, working with teams of horses and was considered an excellent horseman. Jim and his sons James and William lumped wheat with Frank Free [Pearl Free's younger brother]. Back then the wheat was all bagged and stacked in big piles besides the railway tracks...ready to be trucked out by train. There was good money in the wheat then and the Hasty boys used to buy it and sell in on'. In addition to details about the family, John has provided us with a number of photos of his Hasty and Free relatives. Those of the Frees are included on this webpage. Click here to see the ones of John's Hasty ancestors. Jan and Janine Power's Lalbert Reflections tells us that the older sisters of James Baden-Powell Hasty, Alice and Annie Hasty (later Murdock) 'were the Post Mistresses at the Lalbert Post Office. Annie first til she married and shifted to Quambatook to live and then Alice; they were in charge for a good many years'. Their sister Agnes Hasty 'managed the shop in Lalbert owned by Mr Carey after he went to Ballarat; their father was in the shop, Letcher and Hasty, which used to be on the corner where Don McGregor's garage is now' (p. 97). Records contained in the Australian Archives show that the girls' older brother, William Robert Hasty, who worked in his father's grocery shop, enlisted in the First AIF on 1 September 1915 and embarked for active service overseas from Melbourne on the HMAT A54 RUNIC on 20 January 1916. He was part of the reinforcements for the 4th Light Horse Regiment. Rather than going to Gallipoli, William served with the 4th Camel Corps in Egypt, the Sinai and Palestine before returning to Australia from Egypt on 26 July 1919. He is pictured above on the right with a colleague from Western Australia. The photo was taken in Palestine in May 1916. The Australian electoral rolls show Pearl and James Hasty were living at Quambatook at the time of the 1924 election and at Lalbert during the 1930s (James, who may be among the staff pictured outside Hasty's store shown below, was then working as a grocer's assistant and agent). They were registered as living at 14 The Avenue in the Melbourne suburb of Prahran in in 1943 and 1949 (along with their son Murray Bruce Hasty who was working as a salesman). They were still there in 1954, the year of James' death which was reported in the Melbourne Argus as follows: 'DEATHS. HASTY, James B. P. - On March 7 at Royal Melbourne Hospital, loved youngest son of Mrs and the late James Hasty (Lalbert), and brother of William, Agnes, Alice and Annie (Mrs Murdoch)'. The electoral rolls indicate that Pearl moved back at Quambatook after James' death probably to live near or with her eldest son, Aubrey James Hasty and his family who later moved to Harcourt near Castlemaine in central Victoria. Pearl Amelia Hasty nee Free died at Castlemaine in 1972. 1. Aubrey James Hasty (1924-82). 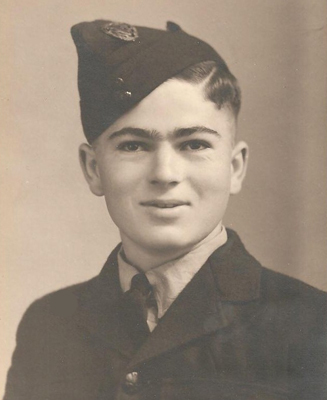 Born at Quambatook in 1924, Aubrey served in the RAAF during the Second World War during which he married Wilma Jean Gross in Melbourne in 1943. The Australian electoral rolls show that Aubrey and Wilma lived initially at Quambatook after the war before, sometime after 1954, moving to Harcourt near Caslemaine where Aubrey worked as a poultry farmer, and later to Barfold and then Kyneton where Aubrey died in 1972. Kerry Free tells us he and Wilma had two sons and two daughters. 2. Murray Bruce Hasty (1926-97) who was born at Quambatook in 1926 and also served in the RAAF during the Second World War, being discharged on 8 May 1946 while serving as a Leading Aircraftman at the Air Force HQ Telecommunications Unit. The Australian electoral rolls show that Murray and his wife, Lindsay Isabel Hasty, lived in Melbourne and probably separated sometime in the late 1970s. According to the 'Mouritz' family tree on Ancestry, Murray's wife was Lindsay Isabell ('Lyn') Mouritz (1928-2013), daughter of Frederick Alexander Mouritz (1895-1985) and Frederick's second wife, Rita Blanche Butcher (1893-1974) who were married in Victoria in 1929. It further states that Murray and Lyn had two children, Ian Robert Hasty and one other, and that Lyn later married Desmond John Betts (1922-2007). Lyn's death notice, published in the Herald Sun on 28 September 2013, reads: BETTS Lindsay Isabella (Lyn) passed away peacefully on Thursday September 26 at Frankston, aged 85 years. Loved and loving wife of Des (dec). Much loved mother of Jan and Ian, mother-in-law of Geoff and Helen. Loving and proud Grandma of James and Fleur, Suzy and Graeme, Brendon and Irene and Stephen. GG of Zac, Ben, Nic and Matt'. The photo on the left is of 'Three Mallee Maidens: Mavis Anders, Pearl Free and Reita Anders'. The one on the right is Aubrey Hasty during the Second World War. 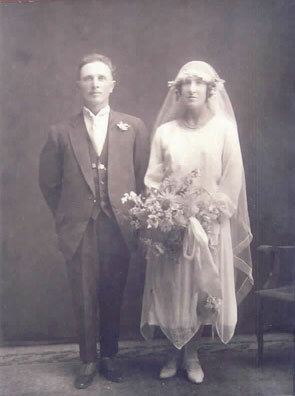 Born at Lalbert Harry Walter Free (1901-1955) married May Victoria Jobling (1902-88) at Kerang on 17 February 1926 (their wedding photo is shown below on the left). The 'Ellis Family Tree' on Ancestry tells us that May's parents were John Jobling (1854-1924) and Ida Marie Schreck (1864-1940). John was born at Newcastle upon Tyne in Northumberland in England in 1854 and came to Australia as a boy. Ida was born at Staffordshire Reef near Piggoreet in Victoria in 1864. 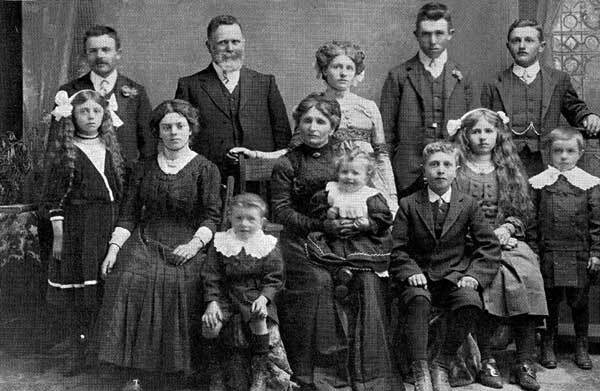 She married John in 1882 and they had no less than 16 children between 1883 and 1905: Catherine, Frederick William, Ralph, John Albert, Lillias Ann, George Ernest, Eda Bertha Louise, Frank Henry, Lewis Herman, Norman Mitchell, Neil August, Ella Marie, Mathew Victor, May Victoria and Austin Thomas Jobling. Ida's parents were said to be Friedrick Wilhelm Schreck (1831-1914) who was born at Standal in Prussia and Anne Catherine Marie Hinsch (1842-1909) who was born in Hamburg in Germany. Anne and Friedrich were married in Victoria in 1861. At the time of her marriage to Harry, May was living with her brother, Austin Thomas Jobling, a farmer, at Teal Point near Gannawarra in northern Victoria. Her parents, sister Lillias and two other brothers, Frederick William and Norman Mitchell Jobling, were also living and farming in the area. May and Harry farmed at Nowie between Ultima and Swan Hill from 1926 until Harry's death there in 1955. May then lived with her son Barrie and his wife Margaret and their family at their orchard at Tresco near Lake Boga until the early 1970s when she moved into Swan Hill (where she died in 1988). She and Harry had four children: 1) Enid May Free who married Frederick Booth at Tresco in Victoria in 1949 and had at least five children (Geoffrey, Glenda, Brian, Jennifer and Kevin Booth); 2) Morris Henry Free (1928-84) who married Merle Harbour at Bendigo in 1951 and had at least one child (Rodney Free); 3) Alice Clare Free who married Maurice Codling (1924-2011) at Tresco in 1949 and had five children - Tricia, Greg, Kerry, Michael and Noel Codling - and at least seven grandchildren and eight great grandchildren we know of; and 4) Barrie James Free who married Margaret Betty Baker at Swan Hill in 1960 and had three children - Kelvin, Colin and Susan Free - and four grandchildren we know of. Alice Martha Free (1903-72) married William Murray Smith (1903-83), a farmer at Pental Island, at Swan Hill in 1941 and had one child, a girl Judith. Frank Rowland Free (1906-2004) married Annie Elizabeth Curthoys (1914-1988), the daughter of William Joseph Curthoys (1887-1965) and Mary Olive Tranter (1886-1954), at Quambatook in 1935 (the photo below shows them on the year before their marriage). Annie's parents were William Joseph Curthoys (1887-1965) and Mary Olive Tranter (1886-1954) who were married at Bendigo in 1911 and lived at Axedale near Heathcote before, in around 1920, moving to Lalbert where William worked as a labourer and carter. We believe they had six children in addition to Annie: Mary Josephine (Maisie), Stephen William, Dorothy Eileen, Irene Agnes, Monica Joan and one other. Frank and Annie both attended the Lalbert State School where Annie obtained the Merit Certificate in 1926, the same year as she, along with Ida Davies, Lily Groat, Daisy Nalder and Florrie Smith, played one of the fairies in the school's celebrated 'Cinderella Contata'. The Australian electoral rolls show that she and Frank farmed land at Lalbert and had three sons there: William Francis ('Bill'), David Geoffrey and Brian Peter Free. All three boys were also farmers, Bill at Lalbert and later Swan Hill, David at Gnawee and Peter at Lalbert). Like their parents, the three boys were also keen sportsmen, representing their district in football and cricket (see the photo below). Annie died at Lalbert on 10 July 1988, aged 78 years. Her gravestone in the local cemetery reads: 'Dearly loved wife of Frank and loving Mother of Bill, David, Peter and families'. Frank Rowland Free died there on 30 August 2004, aged 94 years. The photo on the left is of Harry Walter and May Victoria Free (nee Jobling) on their wedding day in 1926. 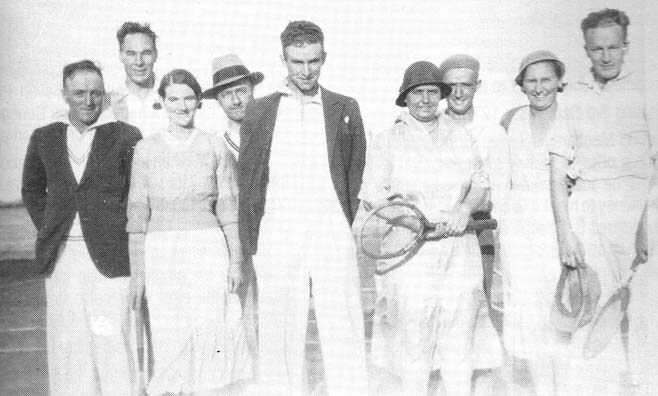 The one on the right shows members of the Lalbert tennis club in 1934. From L/R: Frank Free, Mr Coldsworthy, Annie Curthoys (later Free), Mr Mosley, Tony Meehan, Mrs W. Hasty, G. Plunkett, Queenie McNamara and Cliff Sutherland. Norman Alexander Free (1908-1986) married Venus Adrian Deason (1912-2000) in 1955. Venus' parents were Alfred and Alice Deason nee Scaddon (or Scaddan) who were married in Victoria in 1898. According to the 'Ann Rayner' family tree on Ancestry, Alf and Alice had six children in addition to Venus: Lucas Lionel (died as an infant in 1900), Alfred William (1910-58), Leaflet Lovelock (born in 1902), Zephyr Evelyn (1905), Hugh Luther (1906-2001) and Thomas James Deason (1906-2004). Alice's death notice, published in the Melbourne Argus on 11 July 1952, tells us she was then living at Woorinen South, was the widow of Alfred Deason and 'loved mother of Alfred, Leaf (Mrs. J. W. McInerney), Zeph (Mrs. A. T. Warburton), Hugh, Tom and Vene (Mrs. N. Free)'. The Department of Veterans Affairs' nominal roll for WW2 shows that Norman enlisted in the Second AIF at Quambatook on 21 January 1942. He was then living at Woorinen North and his next of kin was Venus Free. He was discharged on 26 October 1944 at which time he was serving as a private soldier in the 11 Works and Parks Company. The Australian electoral rolls show that, after their marriage, Norman and Venus first lived and farmed at Lalbert. 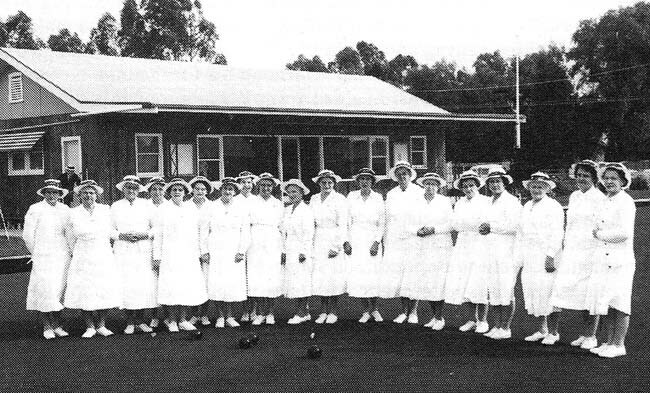 They moved to Woorinen in around 1940 and, in the late 1950s, to Quambatook. Norman died in 1986 and is buried in the Lalbert Cemetery. Venus died in 2000 and, we think, is buried with Norman at Lalbert. Norman's gravestone shows he and Venus had eight children: June, Billy (dec), Trevor, Joyce, Alice, Thomas, Norman and Jennifer Free (dec). We know little about their youngest surviving children. We believe that Trevor Free married Heather Neiwand at Quambatook in 1958. His older sister, June Pauline Free, married John Desmond Patrick ('Jack') Lowry (1930-2006) who died at Wakool in NSW in 2006. Jack's death notice published in the Herald Sun tells us he and June then had eleven children - Des, Peter, Cheryl, Gerrard (Fred), Susan, Rose, Janine, Stephen (Woody), Rodney (Ginger), Neville and Warren (Oonk) Lowry, 30 grandchildren and one great grandchild. James and Johanna's youngest son, Allan Joseph Free (1911-93) married Dulcie Kanowna Alexander (1917-2011), daughter of Henry Alexander (1888-1982) and Isabella Amy Susan Giblett (1892-1979), probably at Lalbert although that is till to be confirmed. Jan and Janine Power's Lalbert Reflections (p. 311) tells us that Dulcie's father was born at Lake Marmal near Boort but lived most of his 94 years at Lalbert (to where his family moved in 1910). He married Amy Giblett in 1914 and had three children in addition to Dulcie: Hazel (Mrs Jack Lavey of Kunat), Arch and Norman Alexander who, in 1982, was farming land that had been 'purchased from the pioneer Hickmott family'. A report of Henry and Amy's wedding, contained in the 1 July 1914 edition of the Quambatook Times, tells us their wedding took place at her parents' residence, 'Mona Vale', at Lake Marmal on 20 May 1914. Amy's brother, Edmund Giblett, enlisted in the First AIF on 18 February 1916 and sailed to England on the A14 EURIPIDES in April the same year. After joining the 10th Battalion in France he was admitted to hospital on 21 November suffering from infuenza. His illness was serious enough for him to be repatriated to England and then, on 17 January 1917, sent home to Australia. He travelled on the hospital ship KANOWNA, the name given to Amy's daughter, Dulcie Kanowna Alexander, who was born the same year. Ratepayers and citizens of Quambatook met at Quambatook Hall during 1974, to say their special 'thank you' to ex-Councillor Allan Free and his wife Dulcie, at a Testimonial Dinner, to mark Mr Free's retirement from the Kerang Shire after 18 years of good and faithful service. The period of service was interrupted when Mr Free became ill, but he subsequently reappeared at the Council table to carry on the good work. During his 18 years service he was Shire President on one occasion, and in line for a second term when his health broke down and he was forced to refrain from accepting the position. He was an active and willing representative of the ratepayers, who appreciated his devoted service. Chairman of the evening was Mr Vic Hahnel . . . who had known both the guests for a very long time . . . and recalled Allan's days as a footballer, tennis player, and golfer, and the sporting manner in which he played the games. Now his activities were limited to bowls, which did not demand the physical effort of other sports. In addition to his work as a councillor, he was President of the Football Club for five terms and the Golf Club for three, as well as being chairman of the Public Park Trustees. Allan Free died at Quambatook in 1993. Dulcie died at nearby Kerang in 2011 and is buried with Allan in the Quambatook Cemetery. Her tribute, published in the Herald Sun on 13 August 2011, reads: 'FREE. - Dulcie Kanowna. At Northaven Kerang, on Aug. 12, 2011, aged 94 years. Late of Quambatook. Loved wife of the late Allan. Loved mother and mother-in-law of Lorraine and Barry, Janice, Allan and Gloria, Dawn and Alan. Loved Grandma Free of her 16 grandchildren and 25 great grandchildren. Mum and Dad reunited'. Allan and Dulcie's only son, Allan Henry Free, married Gloria Jean Holt, daughter of Mr and Mrs F. G. Holt, at Quambatook on 15 February 1964. As Win Noblet describes: 'The ceremony took place at Christ Church of England . . . Gloria was attended by her two sisters, Leslie and Kay, and junior bridesmaid, Miss Dawn Free, and little flower girl, little Leanne Cameron . . . the groom was assisted by Ian Wilkinson and Noel Holt, with Barry Hahnel and Peter Holt acting as ushers. During the service, Mrs Norm Jewson (Margaret Free) sang so beautifully the timeless 23rd Psalm. Accompanying Margaret's lilting notes were the filtering complimentary tones of the organ played by Mrs V. Hahnel. The reception was held at the Memorial Hall where Mr and Mrs Holt and Mr and Mrs Free received the many guests before they sat down to an evening of delicious food, fellowship, toasts and speeches'. Allan's daughter, Kerry Free, tells us that her father 'still lives on the farm that James Oswald bought at Talgitcha. My grandfather bought Samuel and Fanny's farm off their son Ted many years ago. As a kid we always called that part of the farm Teddy's. So basically Dad's farm is now Sam and James' combined'. It is lovely to think that, in this way, the Free (and Shepherd) family's farming heritage and their long-standing connection to Lalbert and its surrounds are continuing on. Ramsay Ritchie. 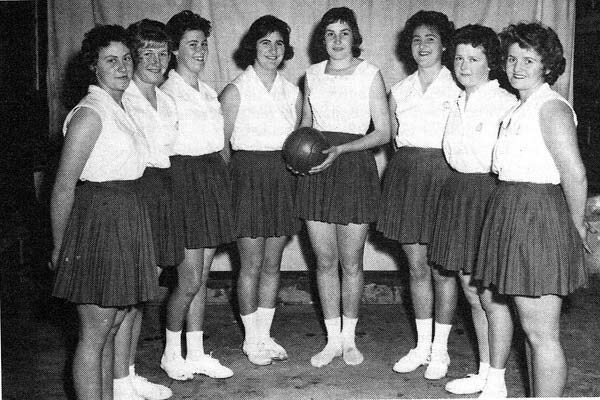 Front row: Lorraine Free, Frances Meney, Verna Bourke, Iris Fitcher, Dulcie Free and Eileen Ritchie. Helen Gross, Lesley Holt, Glenda Tuohey and Jan Free. 'James and Johanna and family c1911', private collection. 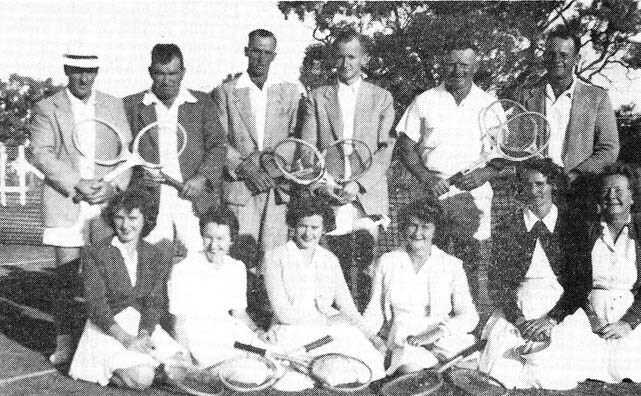 'John James Bailey and family', 'Lalbert lawn bowlers', 'Quambatook netballers', 'Lalbert tennis club', Lalbert Cricket Club' and 'Quambatook tennis club' all from Win Noblet, Beside the Bullock Track: Quambatook 1894-1984 (Bendigo: Cambridge Press, 1984). 'Wedding of James Oswald Free and Emma Elizabeth Oliver', 'Wedding of John James Bailey and Johanna Victoria Free', 'Wedding of John William Free and Boswell Adelaide Rangott', 'Hasty's Store, Lalbert', 'William Robert Hasty in Palestine' and 'Bruce and Aubrey Hasty and grandparents' courtesy of John Hasty. 'Oliver Family in 1913' obtained from Arthur Lipscombe's website, 'The Family Tree of the Adlers, Edwardses, Hogans, Lipscombes and Olivers'. 'Wedding of Harry Walter Free and May Victoria Jobling', courtesy of Margaret Free.